This short note is simply to inform everyone that the non-profit association I started in the Canary Island: “The Canary GNSS Center (CGC)” continues to uncover and publish publicly available GNSS data. 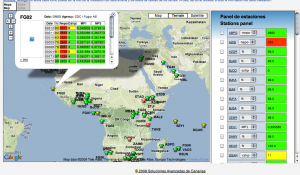 We are mainly a mirroring service, centralizing the distributed African GNSS data into a single server to make life easier for everyone out there doing analysis. 2) Promoting high-quality installations for the benefit of all. GNSS permanent installation can be very valuable for different research fields as long as proven methods are used and international guidelines followed. 3) Uncovering and publishing African GNSS data sources. It has become clear that the CGC cannot easily promote the installation of new GNSS stations so uncovering and making available existing stations is the next best thing! Working following these ideas the CGC has promoted the wider publication of stations in Benin and Ethiopa (established with the help of the NGS), plus the permanent African stations of Fugro Seastar (with a 60 days data publishing delay), plus the permanent South African stations of Trignet, many of which aim to become IGS stations, and finally the new permanent Canary Island GNSS network promoted by GRAFCAN, which has so far made public 3 new stations in the Canary islands. The previous shared information on the CGC is accessible here Previous CGC blog entry.